CAT 2018 Analysis has been available by Endeavor Careers. A national leader in Career Consulting and Guidance industry has released the CAT 2018 full analysis for Slot 1 at www.endeavorcareers.com. 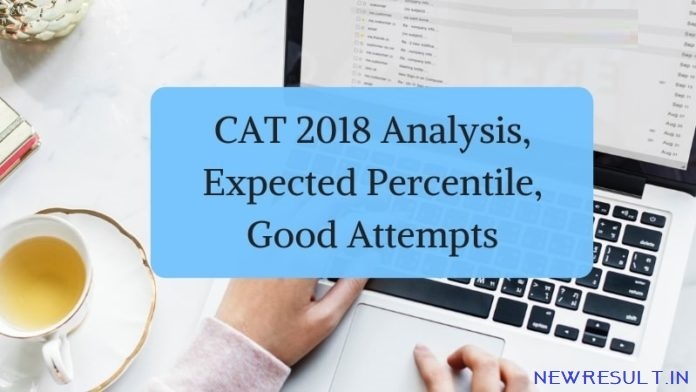 According to it, CAT 2018 has brought mixed reactions from students. Instead of “it was as expected”, the reaction has been turned to “its shock value makes it difficult”. The Verbal Ability and Reading Comprehension section had 24 and 10 questions respectively. According to Endeavor Career, the major surprise in the RC section was the number of question and length of the passage. There were 5 questions in four passages and 4 questions in one passage. All the passages were of 550 to 650 words but the easy language made the passage easy to comprehend. The topics were from evolutionary biology, history- the relevance of recognizing India’s role in and contribution to the Second World War, economics- quantifying, environment -plastic recycling evading the real problem, and assessment of happiness for economic growth, and animal and human behavior. The questions were pretty direct and tricky options were not there, candidates adopting the strategy of eliminating the choices could able to increase their attempts. The questions were from the main idea, inferences, direct, and weaken the argument type questions. Also, the Verbal Ability had 10 questions with 7 Non-MCQ and 3 MCQ type. Para Jumbles were surprisingly easy with either 4 or 5 sentences to rearrange. The 3 summary questions had topics of philosophy and art but had really easy options. The section was moderate. For a 98 percentile, 27-28 attempts here with an 85% accuracy should be considered good. Candidates prepared to face the tough DILR section were surprised to the easy questions as compared to the previous year CAT exam. The eight sets with four questions each had 1 traditional and 1 new-age DI, 3 traditional DI sets and 3 new-age LR sets. Two sets of the 4 category set theory Data Interpretation question and the pipeline new-age LR questions were difficult. All the others were moderate except the pie charts in Data Interpretation set and the arrangement in Logical Reasoning set was the easiest. According to Endeavor Carrer, for a 98 percentile in DILR, 22 – 23 attempts with an 80% accuracy should be considered good. QA section took the headline this year, with the unexpected difficulty the number of attempts of the students has drastically decreased. There were 7 and 3 questions from Geometry and Logarithms respectively. The appearance of the questions was necessary to deceive the students. Easy appearing questions were difficult and vice-versa. There was also a heavy dose of Arithmetic: 3 Time, Speed, Distance questions, 3 Time & Work questions. There were also 3-4 Numbers questions, 2 each of Set Theory, Functions, Average and Partnerships, and 1 each of SICI, Profit and Loss, Percentage, P & C, Alligations and Mixtures, Progressions. The section was moderate to difficult. For a 98 percentile, 25 attempts with 80% accuracy should be considered good.